We all experience stress in the workplace to varying degrees. Some stress is helpful. Some not so much. Some stress occurs due to external changes in our environment like reorgs or budget deficits. Other stresses are internally induced, like trying to learn a new skill or struggling through a difficult conversation. Given all the stressors you deal with day to day, what strategies have you crafted to work with stress? Look around the room and pick an object. Now, use that object as a metaphor (in this instance, a metaphor for stress). What attributes of stress does it suggest to you? It sometimes get jammed and becomes an obstacle to getting things done—stress can feel like that too. Instead of motivating me and helping me accomplish a task, I can feel overwhelmed by it and feel annoyance, frustration, and sometimes anger, especially when I’m in a hurry. Tasks that otherwise might be pleasurable become burdens; people who I might otherwise see as colleagues become annoyances. I sometimes poke my finger trying to remove jammed staples—stress can physically (and emotionally and spiritually) hurt. I can pound hard to make it staple a pile of pages together—physicality helps me reduce negative stress. That’s why I love bike commuting. I start and end my workday with physical, stress-reducing activity. The stapler helps me make order out of loose pages—stress can be useful. It can help me focus on tough challenges. I’ve learned to transform feelings of anxiety before mediating a dispute, or teaching a class, into focused presence. It helps me be aware of, and engaged with, the needs of the participants. 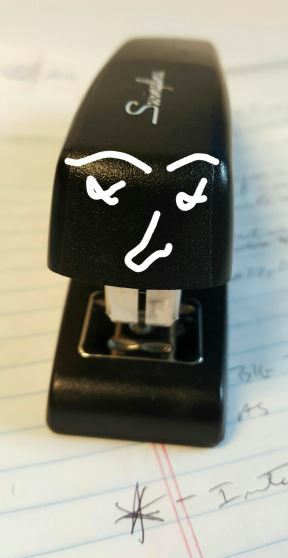 I can open the stapler to remove and refill staples—stress can be studied and understood to help us function more effectively. That’s one of the ways I work with stress. I turn it into a metaphor and play with it. I examine it. And in the process, I intentionally help myself slow down and pay attention so I can learn about it and about myself. I shift from being stressed to noticing how I am being affected by stress. That awareness helps me create imaginative and emotional perspective. I am able to see the stress as something separate from myself. I avoid believing three traps of negative stress—that it is me (I’m stressed!) and inseparable from what I do (my work is stressful!) and where I am (this place stresses me out!). If I can separate myself from the experience of stress, I’m better able to notice more about what I’m dealing with internally and externally. I give myself choices, like deciding not to let the clock be an evil task master and instead create a moment of insightful play. Of fun. Now that’s a better way to work with stress. Turning stress into a metaphor is really a form of playful meditation. The King County Employee Assistance Program offers meditative approaches to relieving stress through it’s Making Life Easier program. Play with stress as a metaphor during a team meeting to unleash your collective wisdom and have fun together. Take the Stress and Anxiety Quiz to score your level of stress and learn about resources to manage it. Keep a Stress Diary. Jot down insights you have throughout the day about what causes you to experience stress, and whether that stress seems to motivate or overwhelm you. Read How To Turn Stress Into a Good Thing and 8 Common Workplace Stressors and How to Handle Them. Watch How to Make Stress Your Friend, a TED Talk by psychologist Kelly McGonigal. ← How can we help each other learn about equity?